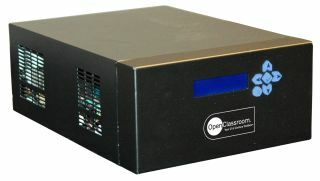 The OpenClassroom Server (OCS) places the teacher in control of an easily managed local Web 2.0 environment. The OCS lets the teacher and students carry out research, communication, collaboration, publication, and other network-based functions through an intuitive interface and provides classroom-level management and control. The OCS can be connected to a network that is also connected to the Internet, which allows students to search the OCS and the Internet simultaneously. can be more quickly accessed from the OCS server. This not only saves time but also external bandwidth. CONS: The cloud model does not have the same speed and security. OVERALL EVALUATION: The OCS-Class and OCS-School provide a speedy, safe, and secure learning environment, while the OCS-Cloud offers the benefits of being managed and hosted by the company.